Adult EAB emerges from the inner bark of an ash tree from late May till September, creating a D-shaped exit hole. 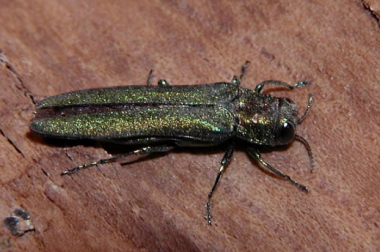 Emerald ash borer insecticide treatment considerations. A variety of insecticide products and application methods are available to professionals for control of the emerald ash borer (EAB). Since the presence and infestation level of EAB is quite difficult to determine at early stages of an infestation, insecticide treatments may be merited to mitigate damage by EAB. However, not all ash trees should be treated as some may be too extensively compromised or in poor condition to receive treatment. Due to the expense of yearly insecticide treatments, one should consider the value of a particular ash tree in relation to insecticide treatment costs before making any treatments. In addition, consider the health of each tree before treating. Research suggests that insecticide treatments are significantly more effective on EAB-infested ash trees with less than 50% canopy thinning. Insecticide treatments are not suggested for trees with greater than 50% canopy thinning. Ash trees with greater than 50% canopy thinning should be removed and destroyed in accordance with established state and federal guidelines. For additional information on this topic, see University of Wisconsin Garden Pest Alert XHT1215 “Is My Ash Tree Worth Treating for Emerald Ash Borer”. University research indicates that soil drenches or injections of imidacloprid provide excellent EAB protection for small ash trees [less than six inches diameter at breast height (DBH)] in the first year following treatment. Larger trees may require two consecutive years of treatment before they are effectively protected. Thus, treatment of large trees should begin before the trees become infested. While spring and/or fall applications are allowed on certain product labels, recent university research has indicated that spring applications have been more effective at controlling EAB and protecting canopy health. Most insecticide treatments must be repeated each year. Products containing emamectin benzoate are labeled to provide two years of protection. Recent university research suggests that some of these products may provide more than three years of control with a single application when used at the highest labeled rate. Trunk injections and implants require physically drilling or coring into a tree during the application of the insecticide. Thus, use of these application methods has the potential to cause injury to trees (especially smaller trees), and may provide entry points for certain disease-causing fungi [e.g., Nectria, the cause of Nectria canker (see University of Wisconsin Garden Facts XHT1094 “Nectria Canker”)]. The University of Wisconsin does not endorse any one specific commercially available insecticide. Products discussed in this fact sheet have been evaluated in a variety of university research tests on EAB (www.emeraldashborer.info). No matter which insecticide you use, always read and follow all label instructions. Avoid skin contact with insecticides and safely store insecticides out of the reach of children.